If you recapture a tagged yellowtail . . . 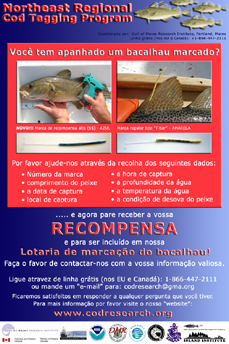 If you recapture a tagged cod . . . If you recapture a tagged scallop . . .
Mission - DFO has a main mission of education and research in the interdisciplinary sciences related to the interactions between marine organisms and marine environments.This covers a wide range of categories including field exploration, laboratory experiments, theoretical research and modeling. 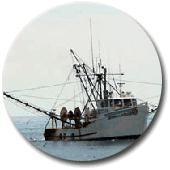 Critical to the development of the DFO at UMass Dartmouth is cooperative research with the fishing industry of New England. New Bedford has been the number one fishing port for the last five years due to the high volume of top quality sea food landed. The scallop industry has worked extensively with the DFO to develop the world's largest video survey data-base of the sea scallop resource and this research has been used in every management plan since 1999. Our specific purpose is to train scientists in the techniques and theory of fisheries oceanography with emphasis on stock assessment, population dynamics, physical and biological interaction and ecosystem modeling. Both MS and Ph.D. programs will address the growing need for marine scientists in Federal and State agencies, academic universities and institutions, and industry. Sea Scallop Research: "The scallop video survey [environmental assessment] constitutes the largest Before-After-Control-Impact examination of the environmental impacts of bottom-tending mobile fishing gear ever conducted." The Massachusetts Marine Fisheries Institute - a new partnership among scientists, managers and fishermen. Read more about SMAST Fisheries: a Decision Support System for Fisheries Science.